Once a month, Capitol Hill Books hosts ‘First Saturdays,’ setting out wine (chardonnay and merlot), cheese, and crackers and giving customers ten percent off. The other week, I went in to browse about and maybe use the last three dollars of store credit remaining on the index card with my name on it that the owner kept under the counter. 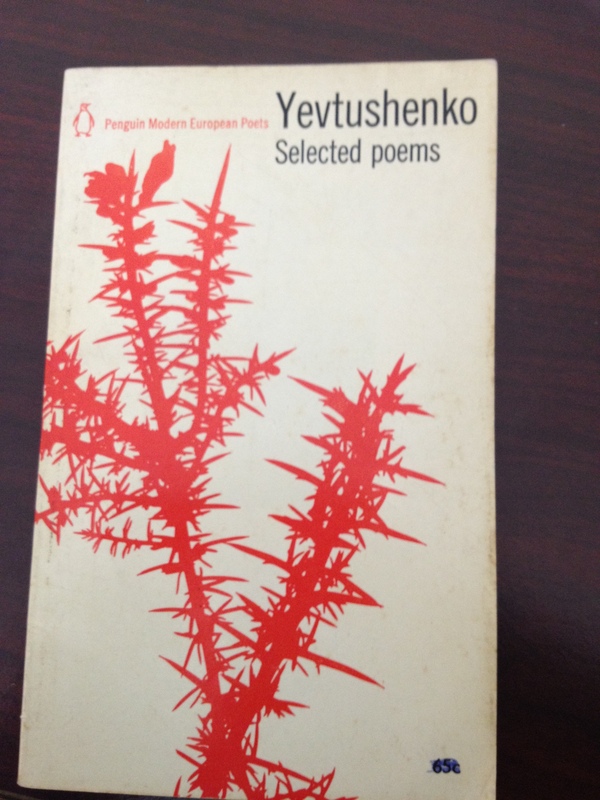 What I bought was an old copy (1963) of Yevtushenko: Selected Poems (I can’t imagine this volume from the old Penguin Modern European Poets series, is still in print). One of the great experiences of my high school years was getting to hear Yevgeny Yevtushenko read in front of a sadly thin crowd at the University of South Florida. He was as enthusiastic and ebullient as one would expect of a Russian poet (Russian novelists may be thought of as a little taciturn, but I think Pushkin set the more extravagant tone for what the expectations are for one of that country’s poets). So I was prompted by the good memories of seeing and hearing him read, as well as a price that was just $1 more than more store credit (and the owner actually just scratched out the last of my store credit and said he’d just call it even). 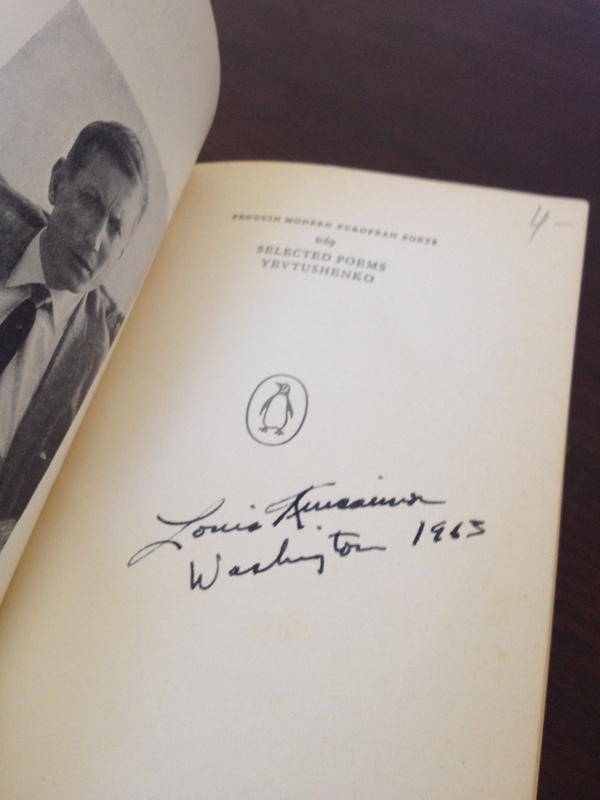 There was also an inscription inside the book and I always like finding one of those inside a nice used book. This intro to this book is rather oddly lukewarm towards Yevtushenko’s poetry. But it comes from a time when poets could still be notable figures, when books were a larger portion of the national discourse, and when a knowledge of the ‘enemy’s’ culture was considered important. Consequently, a poetry collect about which one might have mixed feelings was still felt to be worth publishing and commenting on. The centerpiece of the book is a long poem entitled Zima Junction. It’s about a Moscow based poet returning home to the community in Siberia where he grew up. Firstly, as a historical document, it’s a reminder that Soviet-era Russia was not so monolithically oppressive as conservative fire brands might have wanted us to believe (check out Gao Xinjiang’s Soul Mountain for a similarly eye opening look at China). But also, it’s about the college kid from the small town coming back. While he hasn’t been gone long, those years of early adulthood are very formative, so he’s caught between the worlds of Moscow literary culture and the rituals and rhythms of rural Siberia. The narrator is shown off to family, taken to events believed befitting an educated local boy done good, and fed great quantities of home cooked food to compensate for the presumed failings of the capital’s kitchens. The wistfulness of the poem is exactly right and fully captures that feeling of ‘you can’t go home again’ (and in just twenty odd pages, as compared to voluminous text required by hypothetical other writers one might name). The spare language captures elegantly those rhythms and rituals, I mentioned, and by capturing them through an eye that is both distant from and familiar with them, the detail and distance is just right from the reader who is not from Siberia, but does know the feeling of coming back to a place one used to belong to (but doesn’t anymore). So if all you know of Yevtushenko is Babi Yar from the choral section of Shostakovic’s 13th, than Zima Junction is a good way to see another, less political side. The book, if you’re interested, was reprinted quite recently as a ‘Penguin classic’, with a new introduction – by my Dad who co-translated the works with Peter Levi. That’s awesome! You must be incredibly proud!